Opening Reception: Friday, December 11, 2009, 7-9pm. 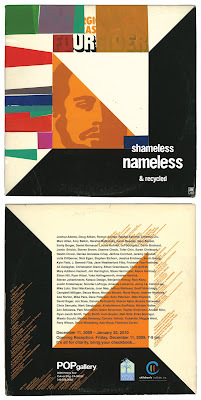 Shameless = anything goes…content and medium included! Shamelessly inexpensive too! Everything is 100 bucks! 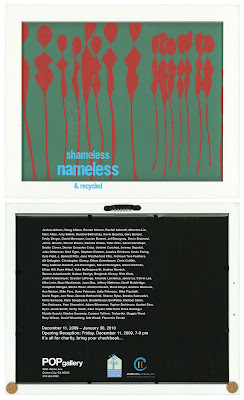 Nameless = we showcase all of the artwork anonymously. Artists’ names will appear alphabetically on the show card and catalog, but the work itself shall remain unsigned… nameless… anonymous! This plays into the charitable spirit and adds a bit of intrigue! Recycled = the idea is that the artists can recycle their previous work or recycle their past ideas, or even recycle something that has inspired them. The only parameter is that each piece is no larger than 12” x 12” square. Paintings, woodwork, books, zines, sculptures, music, photography, illustration and other mediums will all be shown and heard. We are aligning with two local charities: The Downtown Women’s Center and The Children’s Institute. Each buyer will be able to choose to which of these charities they would like their money to go. When children are traumatized by violence, their chances of growing up to lead healthy, productive lives are threatened. They are more likely to fail in school, enter the criminal justice system, and repeat the cycle. With intervention, though, the harmful effects of violence can be mitigated and the cycle broken. CII provides healing so traumatized children can recover and lead healthy lives, while working to shape the field of children’s services through innovative research, demonstration projects, and professionally accredited training programs. Payment shall be made by check only. No cash or credit cards accepted. Checks will be made out directly to: Downtown Women’s Center or The Children’s Institute, Inc.
Shameless, Nameless & Recycled will be on view at POPgallery (3505 Helms, Culver City, CA 90232) from December 11, 2009 through January 30, 2009. 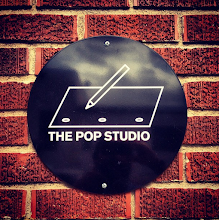 Gallery hours by appointment, please feel free to contact us Monday through Friday, 11am to 5pm.